Compton, Jonathan L., Justin C. Luo, Huan Ma, Elliot Botvinick, and Vasan Venugopalan. “High-Throughput Optical Screening of Cellular Mechanotransduction.” Nature Photonics 8 (2014): 710–15. doi:10.1038/nphoton.2014.165. Our microTsunami (uT) microscope comprises a research grade Olympus inverted microscope and a pulsed laser beam (Figure below (left)). A uT is generated by the deposition of a single pulse microbeam of wavelength 532 nm and pulse duration 500 ps into the sample. In order of sequence, a single pulse from a Q-switched laser if focused above the cover glass, on which a confluent layer of cells can be cultured. Via the process of optical breakdown, a hemispherical cavitation bubble is formed, which quickly expands and collapses, as shown in the image sequence below (right panel). As the bubble expands and collapses it displaced water (or culture media) across the surface of the coverglass, exposing cells to transient fluid sheer forces, including those cells hundreds of microns from the laser focus. This process is well illustrated below in which a single laser pulse generates a plasma, which in turn generates a rapidly expanding and collapsing micro aviation bubble (uCB). Cells beyond the uCB deform under fluid flow shear forces. 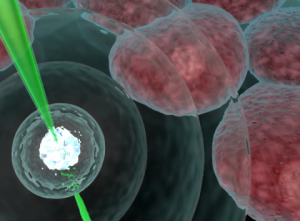 In the seconds following the uCB, cells begin to signal (flash red), an event used by our group to test hypotheses related to mechanotransduction. 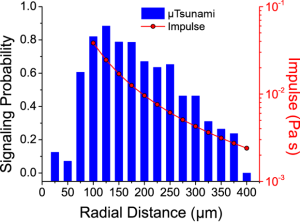 The blue bars report on the probability that cells at a given radial distance from the laser focus will signal. The red curve represents the shear stress impulse experienced by cells cultured on the cove glass. In this experiment endothelial cells were cultured in a confluent layer and uT-induced calcium release from the endoplasmic reticulum was detected using the calcium-sensitive dye Fluo-3/AM. As a demonstration of the utility of uTs, we can conduct fluid flow mechanotransduction experiments in a multi-well plate. Endothelial cells were cultured in a glass-bottom 96 well plate, and a different drug (from the UC Irvine compound library) was deposited into each well. 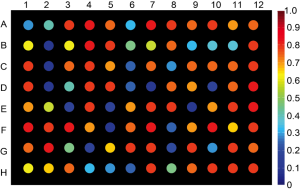 The color bar represents the probability of signaling inhibition for cells cultured in an annular region bound by circles located at 100 and 150 microns from laser focus. Microwells colored in red showed high cell-signaling inhibition, and microcells colored in blue showed little to no inhibition.